Unfortunately, Australian anime costuming has a very small representation in the view of Australian costuming in general. In the 80's most anime fans were not very demonstrative of their fandom to the extent of dressing up as their favourite characters. 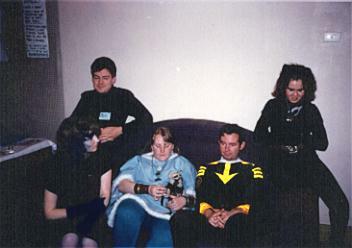 In addition, there wasn't the motivation to dress up as characters that most SF fans would not be able recognise. Nowdays, with anime more popular than ever before, it seems the fandom that accompanies this popularity stems not from the heritage of SF fandom, but more from the idea of anime as a "hip" phenomena. Very few anime fans are SF fans, at least from my viewpoint. Of those that are, almost none of them dress up as anime characters. The pictures shown here span over a decade, from the earliest efforts of people such as Lewis Morley and Mike McGann, to my efforts of the nineties. 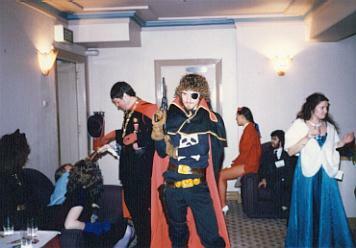 On a personal note, I appear to be the only currently Australian cosplayer: at AnimeCon 1991, in San Francisco, I performed at the inaugral masquerade. In the four following US anime conventions I attended, I performed at each of the masquerades, and also at ComiCon International 1997 and 8, also as an anime character. On those occasions I have won three awards for my performances. I would be amiss if I didn't say that I'm proud of my efforts; whilst I wouldn't say that I'm representing Australian anime fandom through my performances, I am glad to be flying the flag for one fan who loves performing on stage, playing characters he likes, and generally having fun. And that's the most important thing. L to R: Kazuya Nishiura, Toshiaki Koroki & Mika Wakisawa, Hallowe'en Party 1985. Lewis Morley, Captain Gideon (Star Blazers) 1985. Lewis Morley played Captain Harlock at Kinkon 2, 1987. Mike McGann as a pilot from the Black Tigers (Star Blazers.) Taken at Kinkon 2. 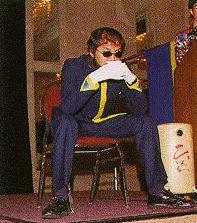 Me, as Gendou, Anime Expo 1997, taken from NewType magazine, September 1997. 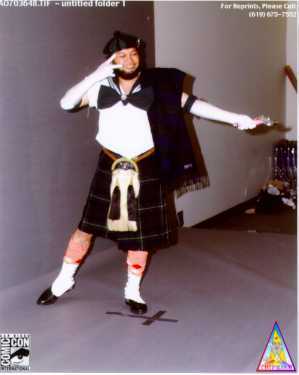 Me, Angus McLune, the Sailor Scot at ComiCon International: San Diego 1998. Version 2.0, Dated 1 November 1998.